BOUGAINVILLE IS SAID TO BE the largest and richest island of the Solomon archipelago. In the dream days, oral history claims that traditional trade goods from as far as Malaita Island ended up in Bougainville. Among the most rascals of Bougainville cocoa and copra are non-Bougainville companies such as Outspan, Garamut and Agmark. They have local Bougainvillean agents who buy cocoa or copra under licence. There will be significant revenue for Bougainville if Bougainvilleans can establish local companies for the direct export of their resources to international markets instead of feeding PNG’s East New Britain province and others. Bougainville’s small scale alluvial gold mining industry is also not benefiting Bougainville but generating income for PNG. 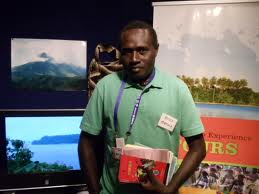 According to Martyn Namorong’s 2011 article, Bougainville’s weak government unable to stop looting, an estimated K300 million worth of gold is leaving Bougainville illicitly. This figure could be supported by a 2010 story by Satish Chand, Bougainville bouncing back, that noted a local assayer as smelting 1.5 to 2 kilograms of gold per week. This converts to up to US$86,000 valued worth of production a week. These natural resources are not generating socio-economic change for Bougainvilleans because Bougainvilleans are not working to take full entrepreneurial ownership of their labour and resources. With full control of these few major resources, Bougainville could develop other still idle agricultural resources that are struggling. All these problems are the fruit of our leaders playing Bougainville politics in Papua New Guinea shoes despite the fact that the island lost 20,000 people under PNG politics. Bougainville does not really need a massive impact project to kick-start development. All Bougainville needs is responsible management skills and a visionary political leadership.